Clydesdale Western 3s dropped a place in Women’s Championship Division One following a hard fought draw at home to Watsonians 2s. The L3s would have been hoping to maintain their status as dark horses in Championship One following positive results against Uddingston 1s and ‘Dale Western’s 2s at the turn of the year. But they missed out on the opportunity to remain third in the league after goals from Alice Sherwood and Catherine Stirling gave the L3s a 2-2 draw at Titwood against Watsonians 2s. The L3s do remain five points clear in fourth place of their Edinburgh opponents after Saturday’s draw. Dougie Mann produced a number of superb saves as Clydesdale Men’s 3s survived a barnstorming second half from Hillhead 3s to take all three points at Titwood in Men’s West District Division 1A. Mann produced over a handful of crucial blocks and stops – most notably from a reverse stick shot by Hillhead’s Alan Meikle midway through the second half – as ‘Dale 3s held on to a 3-2 lead to keep them fifth in West 1A. Hillhead did take the lead early on after a pass was made to unmarked forward to tap in at the back post. But the home side hit back to devastating effect when Ian King slapped home a loose ball in the D. King was involved in goal two as an effective press featuring Steven Clark and Ethan Robertson saw the latter square the ball for Jeetinder Berman to tap in. Berman was then involved in the third, as the forward was awarded a penalty flick when he was adjudged to have been fouled whilst in the act of shooting. Colin Moulson stepped up and scored, despite the Hillhead ‘keeper getting a touch to it, to give the M3s a 3-1 lead at half time. Hillhead 3s, to their credit, stepped up and deservedly forced a goal back a when a ball was looped up for their forward to volley low in to the goal. Either side of that second Hillhead goal saw numerous chances that were thwarted crucially by Mann as ‘Dale Men’s 3s held on to take all three points. Clydesdale Western 2s restarted their season in Women’s Championship Division One with a comprehensive victory against George Heriots FP 1s at Goldenacre. The L2s hopes of being champions come the end of the season were dealt a huge blow following their 1-0 defeat to the L3s back in November. But in their first game of 2019, and under the new captaincy of Lesley Cosh, they won 5-1 against George Heriots FP 1s with two goals coming from Naomi Harkness and a goal each from Julie Lonergan, Tia Mansbridge and Lucy Arnold. The L2s remain in third, nine points behind league leaders Edinburgh University 2s whilst having a game in hand. Clydesdale Western 4s qualified for the Semi Finals of the Women’s West District Cup following their Quarter Final victory over Glasgow University 3s on Sunday. 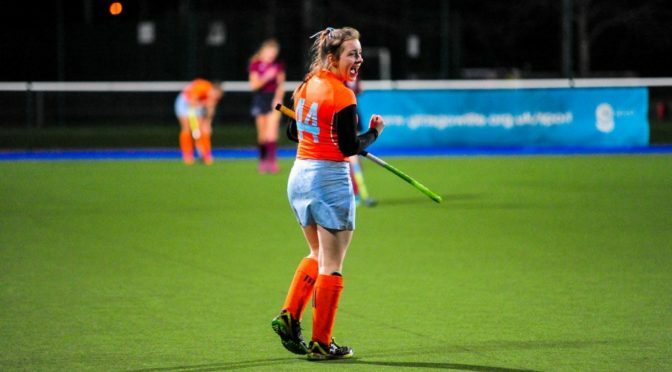 The two sides have a considerable gap in Women’s West District Division One, with the L4s sitting in sixth, four places above rock bottom GU 3s. But the gap was unrecognisable as the L4s fought hard to win by a single goal from Catherine Stirling. The 1-0 win sees the L4s qualify for the Semi Finals of the West District Cup where they will play away to Glasgow Accies in a fortnights time.